Planning for the 'Cultural History Center of Jewish Bardejov' in Beith Hamidrash has been progressing. We are working with local architects under the supervision of Mr. Giora Solar, a specialist in conservation architecture who has been part of our BJPC team. The architects have been updating the existing restoration plans so we will be ready to submit a grant application for the restoration of the building. A structural engineer evaluated the condition of the building and together with the excavation—which we reported on in July and August—we were further assured that the building structure can sustain the restoration. 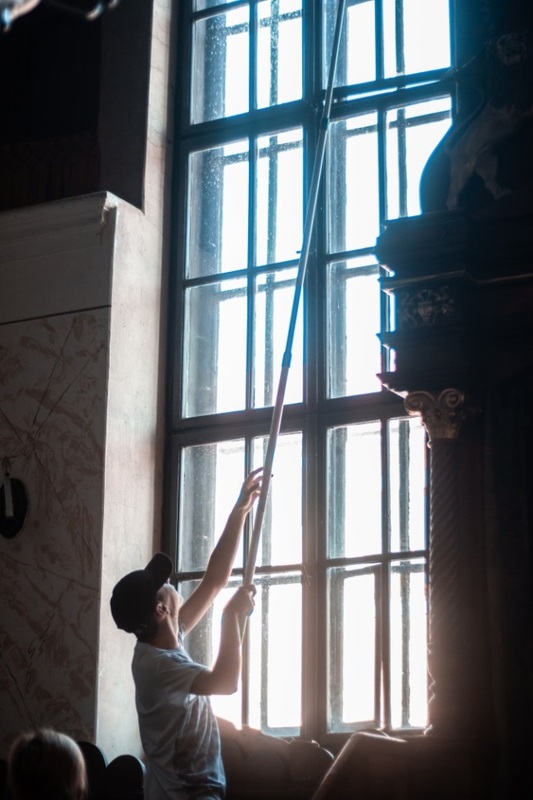 On September 20 th , 2018, Bardejov Jewish Preservation Committee, in cooperation with the Youth Parliament of Bardejov and UZZNO, organized a unique event to clean the windows of the Chevra Bikur Cholim synagogue. This important building, which served Bardejov’s Jewish community since 1929, has remained in its original state since then. It is located on Kláštorská Street in Bardejov. Cyril Bogol, a local Bardejov citizen, and his wife have been the caretakers since 2006, when Mr. Spira—the last Jew in Bardejov and the caretaker of the Synagogue—passed away. 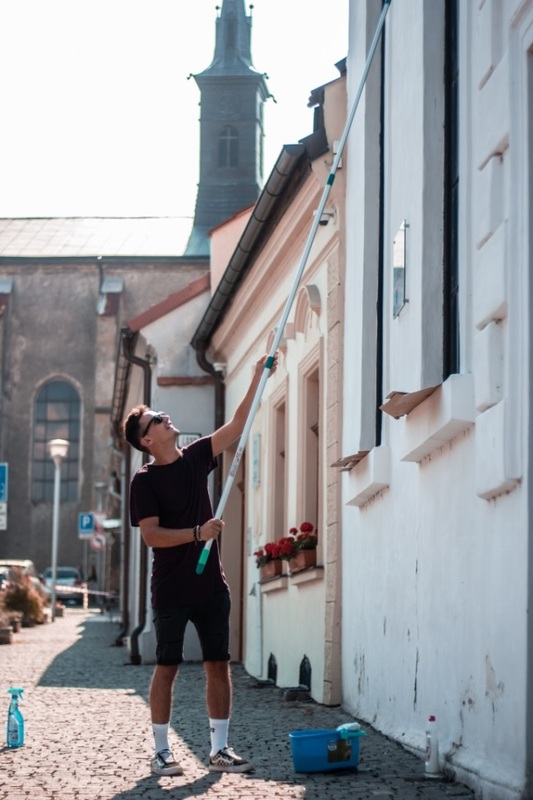 The initiative to voluntarily clean the windows of Bikur Cholim came from the students of Bardejov’s “Private High School”, the chairman of the Young Parliament Jakub Boruv and his colleague Bianka Térjeková. When touring Bikur Cholim Synagogue with their school they noticed the condition of this remarkable monument and the need to improve the state of the synagogue. This was even more apparent after they visited the beautifully restored old synagogue. When looking for a suitable date at the beginning of the school year, September 20 th was chosen. 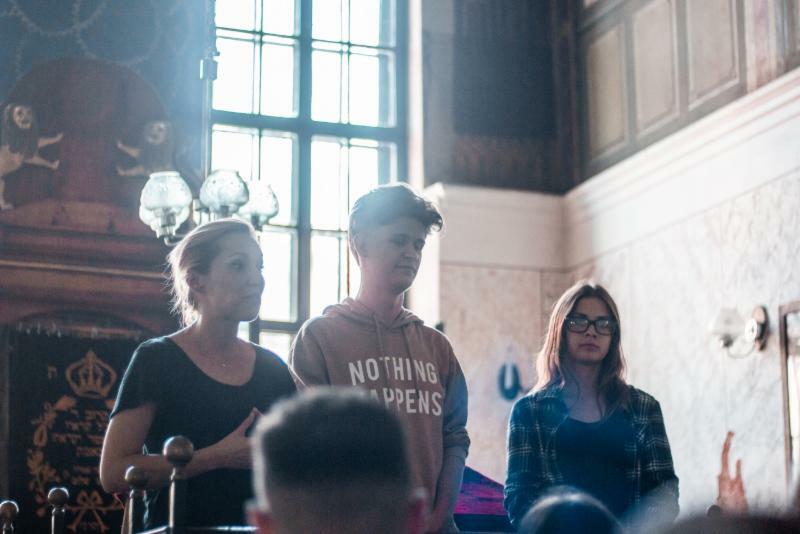 Then some interesting symbolism was discovered: At the start of September, Student Day was celebrated in Bardejov, while the third week of September was dedicated to volunteering across Europe. Furthermore, there was a special Jewish significance as the event took place during the Jewish High Holidays at the beginning of the new Jewish year. 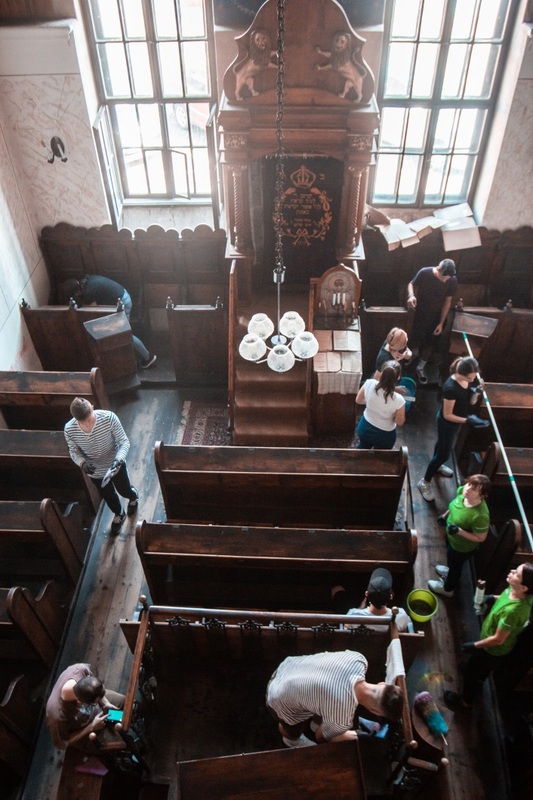 In addition to cleaning the windows, students cleaned the interior of the Synagogue. Twenty two students arrived at the synagogue, rolled up their sleeves and cleaned the windows as well as the interior of the synagogue. Two weeks after the event, all the volunteers were invited to attend a lecture that took place in the synagogue. During the lecture, the students learned more about the life and traditions of Bardejov’s Jewish Community and also about Kristallnacht, when the windows of 267 synagogues and 7,000 storefronts of Jewish shops were broken in Germany, Austria and the Sudetenland three weeks after the High Holidays of 1938. 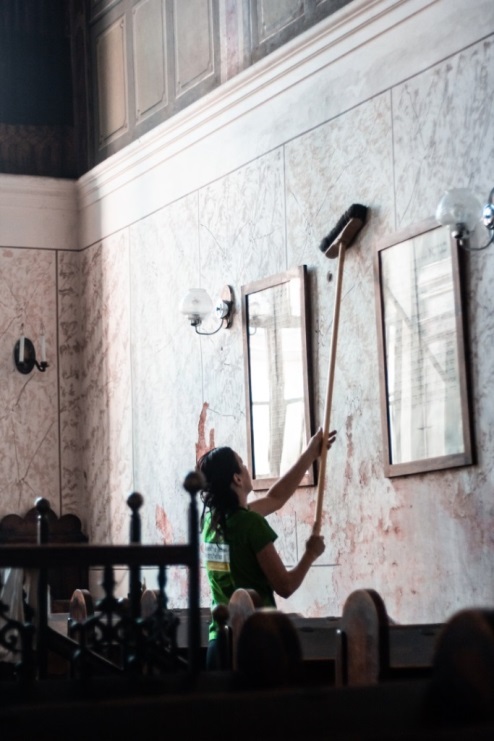 Indeed it was especially symbolic that Bardejov students chose to clean the synagogue’s windows, an act which was the actual opposite of the horrors of Kristallnacht. This younger generation is the hope that the events of Kristallnacht and the Holocaust will never be repeated. 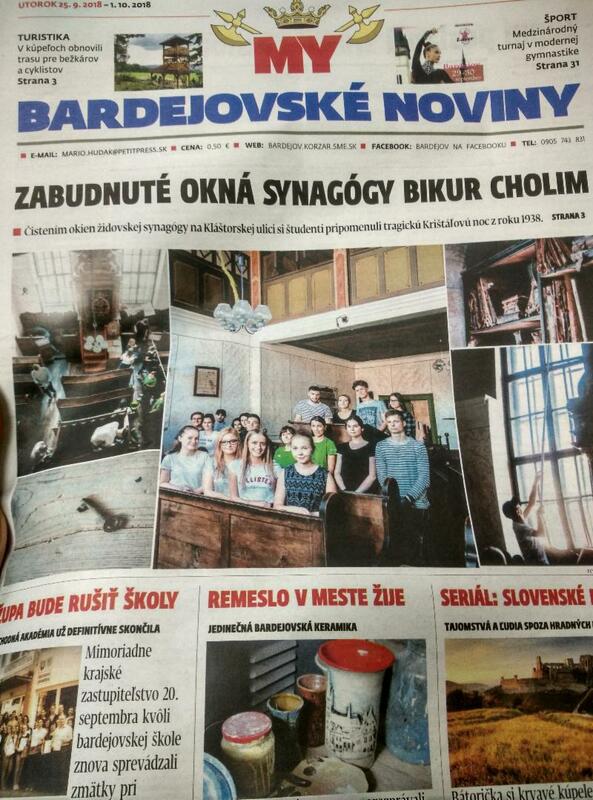 Front page article about the 'Windows Project' in Bardejov's local newspaper. 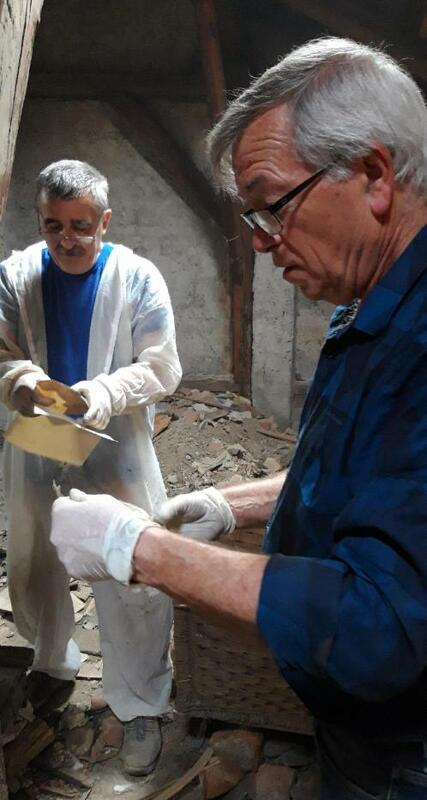 In September, our Local Bardejov team, with the approval of UZŽNO, sorted through and cleaned the attic of Chevra Bikur Cholim Synagogue uncovering many valuable documents, drawings, prayer books and other items that were left behind. All these objects help tell the story of Bardejov’s Jewish Community. At the same time, we also managed to go through the attic of Beith Hamidrash (in the Jewish Suburbia) where surprisingly, after all these years, we found many valuable artifacts documenting the life of Bardejov’s Jews. Only further and thorough research will tell us more about these documents. 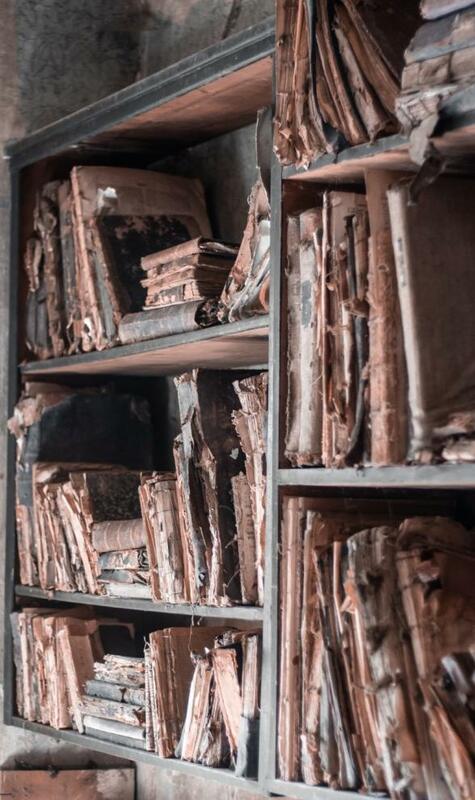 We also plan to catalogue and restore the old books that were stored in Bikur Cholim for many years. All these items will be included in the exhibition which is planned for the yet to be restored Beith Hamidrash. We plan to translate the documents from Hebrew to English so as to fully comprehend their individual value. Giora Solar (right) and Pavol Hudak, sort through the findings in the attic of Bikur Cholim. 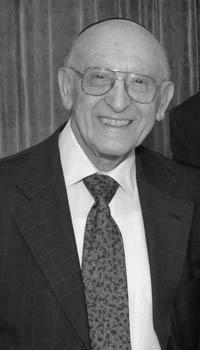 It is with great sadness that we inform you of the passing of Mr. Jack M. Nagel on Oct. 12 in Los Angeles. He was 96. Jack was born in 1921 in Krosno, Poland, a town 35 miles northeast of Bardejov. His mother, Esther Derschowitz-Spira, of Bardejov was a granddaughter of the famed Bardejov Nova Vesser Zayde, Avraham Spira—who was also the great grandfather of Emil Fish. In the late 1930s, as the Nazi threat grew, the Nagel family (Jack’s father, mother, and 3 siblings) moved to Bardejov and lived there is relative safety until the deportations of 1942. The family was deported to Auschwitz-Birkenau. Jack and his sister Gloria survived the Holocaust while the rest of his family perished. In 1947 Jack moved to the United States, determined to succeed. He then moved to Los Angeles in 1955, and married his wife of 63 years- Gitta. In Los Angeles, he started Nagel Construction Company, later renamed Decron, which has been recognized by many organizations as one of the most successful family-run real estate businesses in California. While his business success was impressive, Mr. Nagel and his wife Gitta took greater pride in their philanthropic achievements and community-building. For the past six decades, Jack and Gitta gave their time and resources to many major Jewish and Israeli organizations. 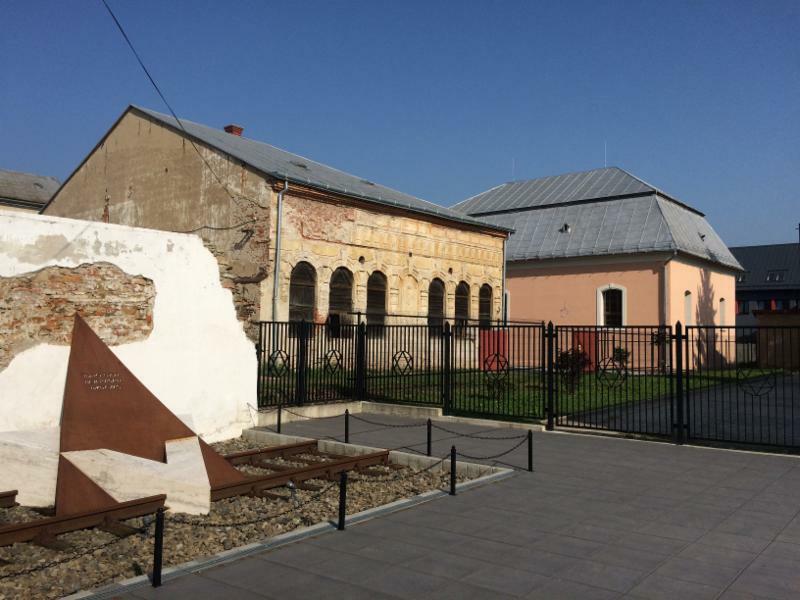 The Nagel family also made generous contributions to the restoration of Bardejov’s Jewish Cemetery and the Bardejov Holocaust Memorial, for which we are very thankful. May God comfort Jack’s family, his wife Gitta, sister Gloria (Victor) Ungar, their children Ronnie (Cheryl) Nagel, Esther (Paul) Lerer, David (Marnie) Nagel and Careena (Drew) Parker, their 15 grandchildren, and 11 great-grandchildren during the time of their bereavement, amongst the other mourners of Zion and Jerusalem.